Our Brown Stock Washing solution optimizes any countercurrent displacement or diffusion washing process. The mathematics behind this very complicated dynamic process have solutions, yet attempts to control this kind of washing system have generally not been very successful. This is due to the lack of reliable measuring instruments and analyzers that are necessary to provide the critical information needed for the optimization and control of this process. Conmark Systems Instruments offers a hardware package using our Duralyzer-NIR analyzer along with rotary consistency analyzers to help solve this problem. Not only are our analyzers reliable and low-maintenace, but also retractable gate valve assemblies are provided for the consistency analyzers and sampling systems for the Duralyzer-NIR. For the consistency analyzers, dilution flow measurement and control must be available or added. Our solution also provides a Consulting Service for the mandatory process study to develop the mathematics needed to be programmed to the existing DCS System (or an auxiliary computer). Monitoring the shower solids at the remaining stages to quickly detect possible washing problems. In the case of an evaporator limited mill, the solids and dilution factor issues are amplified. Also for bleach mills, no bleaching action can take place until the excess sodium in the pulp has been neutralized adding the cost of expensive bleach chemicals. The Duralyzer calculates all the critical Brown Stock Washing Plant Indicators like Weight Ratio (W), Relative Yield (Y), Relative Washing Loss (1-Y), Washing Liquor Ratio (R), Dilution Factor (DF) and the entire plant Efficiency Factor (E). The last washer Fresh Water Flow is also controlled based on combination of the listed indicators. 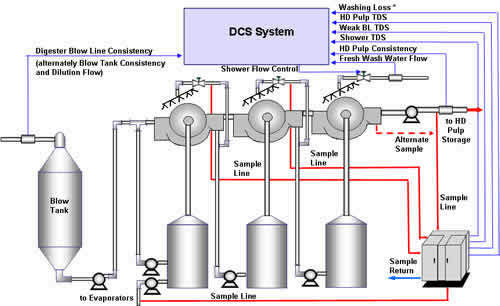 All the critical factors needed to optimize any countercurrent washing plant are continuously displayed, recorded and at the operator’s disposal for optimum operation. In a well instrumented Washing Plant, the upstream shower flows are automatically controlled to maintain steady Seal Tank levels along with Washer Vat levels to control the drum speed. To monitor the performance of each washer, the filtrate shower total dissolved solids is measured to detect and warn of plugged filtration, excess soap formation or any other process disturbances. For the Kraft Process, we have guidelines between the Weight Ratio (W) and Yield (Y) to arrive at the optimal operating point. Thus, the system will be able to suggest to the operator the needed changes for the best efficiency available for any individual Washing Plant.